Whats in the House-passed American Health Care Act? The Employer Mandate is cancelled. While it is unlikely that this will have any real effect on employers offering benefits, it takes the pressure off. The Cadillac Tax is delayed until 2026. Interesting. Considering that the biggest problem with this section is that it doesn’t trend for costs, it pretty much guarantees every employer will be subject to it in 2026. It is unlikely that this tax will ever actually be implemented. States get control over what benefits are required. Therefore states will be able to eliminate benefits that currently are required, such as Maternity, Mental Health, and drug addiction. While this will help lower premiums, it also allows for cuts of benefits some consider essential. Further, it will make the landscape harder in some respects – Liberal states will most likely keep all the essential benefits (and perhaps add more), while many states would probably eliminate some benefits. Companies with employees in multiple states will have to deal with differing level of benefits. Expands the contributions allowed for HSA and FSA plans. Obamacare had limited this popular benefit. Tax Incentive for SHOP gone- The little used SHOP program loses the small business tax credit that was supposed to drive employers to it in the first place. Whats to become of subsidies? Cost-sharing subsidy payments from the government are estimated at $7 billion this year and $10 billion next year. Without them, insurers say they would need to raise rates at least 20 percent next year. This legislation doesn’t address that. Control Rates- Maryland just released the rate increase requests for 2018 and they range between 18-58%. While the subsidies go up with the rates, this will probably cause a significant disenrollment. 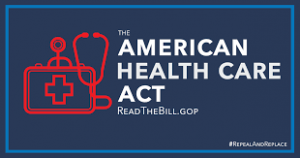 Important Note: Jason Cogdill, a labor attorney, says “The bill is not binding law and has no impact on the provisions of the Affordable Care Act (ACA) unless and until the AHCA is passed by the Senate and signed by the President. It remains unlikely that the Senate will pass the AHCA in current or similar form. The Senate has several potential options, but with Republicans holding only a slim 52-48 majority, it seems that the upcoming process could be lengthy and cumbersome. Among the possibilities, the Senate could modify the existing bill and collaborate with the House on a combined version, the Senate could pass an entirely different bill, or the Senate could even fail to act on this bill or health care in general. Regardless of the potential path, it appears that the political process will continue for some time, with the primary difference being that the responsibility and pressure have moved from the House and President to the Senate and President. This entry was posted	on Monday, May 15th, 2017 at 7:59 am	and is filed under Health Care Reform. You can follow any responses to this entry through the RSS 2.0 feed. You can skip to the end and leave a response. Pinging is currently not allowed.